A+ RATED CARRIERS, COMPETITIVE RATES, SPECIALIZED COVERAGE AND MUCH MORE! If you are looking for RV insurance, you have come to the right place! Start your quote online and let us shop the market for you. We will provide you options from multiple insurance companies for your motor home, fifth wheel, or travel trailer! We Represent companies such as Foremost Insurance, National General Insurance, Progressive Insurance, and Safeco Insurance. Availability does vary by State. With up to 4 different specialty RV Insurers at their disposal our licensed and knowledgeable agents can create an insurance policy to fit your needs. From Class As to a Class Cs, campers to fifth wheels, full-timers to recreational users, and everything in between, the RV Insurance Professionals know RV insurance. Serving RVers since 2000, our insurance specialists are pros at finding the right coverage for your insurance budget. We are proud of our track record of providing great service to our customers. If you haven’t tried the RV Insurance Professionals, start your quote online today and start saving money. If you have an RV, you need RV insurance coverage. Because while motorhomes roll on wheels, but that does not make them cars. Seems pretty obvious, right? Unfortunately, there are a number insurance companies that don’t seem to understand that, and their RV insurance policies are little more than auto policies. An RV is a specialized vehicle and deserves the specialized coverage. What do we mean? Of course there is basic auto coverage, but there is so much more to RV insurance coverage. Let’s look at things visually first. Liability – Covers the bodily injury and personal injury that you cause to others. Medical Payments – Pays for the reasonable expenses for medical and funeral services caused or sustained by an insured while occupying the vehicle. Personal Injury Protection (PIP) – PIP is like Medical Payments in that it pays for Medical Expenses, but also provides coverage that Medical Payments does not including lost wages and services you may be unable to perform due to injuries from a covered accident. These include child care, rehabilitation, and other similar services. Uninsured/Underinsured Motorist – What happens if you are hit, by someone who doesn’t have insurance, or who doesn’t have enough insurance? If you have uninsured and underinsured motorist coverage your policy can provide coverage and act as if the person responsible had coverage or sufficient coverage. So, this coverage can cover medical bills and other out-of-pocket expenses. Also, depending on the state it can cover you for pain and suffering, inconveniences and other expenses that are not out-of-pocket expenses. Damage to your Vehicle – This includes collision, and other than collision coverage. Collision – This coverage includes the upset or roll-over of your vehicle and an impact with a non-insured vehicle. Pretty straight forward. This coverage is subject to a deductible. Other-than-Collision – This coverage includes 10 specific things, and much more. So, things that are covered under other thank collision include falling objects, fire, theft, Explosion or earthquake, windstorm, vandalism, riot, collision with an animal, and glass breakage. Other-than-Collision coverage isn’t limited to these 10 things, but the insurance companies have said that these 10 things are definitely not-collision. This coverage is subject to a deductible. 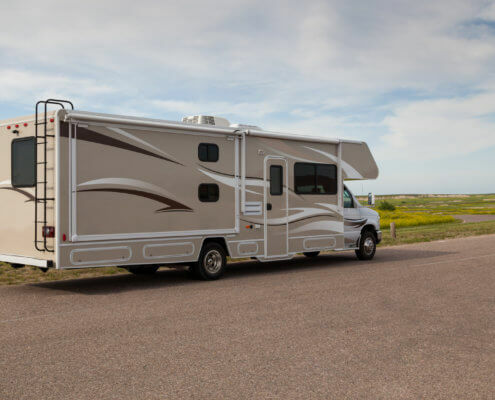 Specialty Coverage – Everything above is the same as an auto policy, but what makes an RV policy an RV policy is the specialty coverage. The things that make an RV different from your auto. Learn More about RV specialty coverage. Gila Insurance Group LLC constantly monitors the market and carefully chooses the insurers that we use to provide Recreational Vehicle Insurance coverage for our customers and distributors. We only represent insurance companies that have proven their stability and who carry a “Superior”, “Excellent” or “Good” rating from A.M. Best.